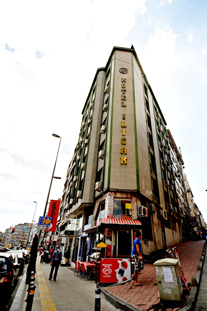 Hotel Ilıcak,with its modern building and warm decoration,is located in the midst of the most important shopping centers in Fındıkzade district of Istanbul.The Hotel is very close to interesting historic sites such as Grand Bazaar,museums,Sultanahmet mosque and palaces. You can go to all of these places by taking the tram that passes in front of our hotel in İstanbul. The hospitals (Çapa ,Vakıf Gureba,Cerrahpaşa and Haseki Medical Center) are very close to our hotel. The airport is only 8 miles distance from our hotel. Hotel Ilıcak is equipped with 48 rooms ( 96 beds ) all containing, TV, direct telephone facilities,music and private bath. You may be assured that you will highly enjoy your stay with us. With our comfortable lounge,the pleasant atmosphere of our restaurant and our meticulous meal service, fire alarm systems and security cameras,you will find a real peaceful and secure environment in Hotel Ilıcak. Enjoy these spacious room, which are exquisitely decorated in a modern style.